Sunday morning began with uncertainty. What would the day hold? For two hours or more I watched beside Kristy's bed. I called and had others lead our morning worship service and stayed with her and prayed and waited. She had experienced an extremely rough Saturday and had become somewhat unresponsive. There was much concern. Sometime around 10:30 to 11:00 AM Sunday morning, things changed for the good. For twenty hours or more Kristy had almost no liquids, a fever, and severe confusion. She wouldn't or couldn't take food or water. Last night the hospice nurse was very concerned and not optimistic about what the next day would offer. Then Kristy wanted water. She began to smile. She began to get clearer in her thoughts. It was as if a miracle was occurring. These were moment to sweet to explain. Sunday afternoon, a kind couple brought food after church for lunch. They hugged Kristy and told us they had brought fried chicken to eat. As they left Kristy's room, Kristy said, "I want some fried chicken to eat." She had not eaten or drank for hours and now she craved fried chicken. Now this is a true Southern Belle pastor's wife for sure! Later Aunt Joe and her two daughters, Jan and Pam, came to visit. Kristy always perks up for them. She smiled and weakly shared her love. We laughed and told family funnies and had a big time with Kristy grinning right along with us. Then, I decided to tell Pam, Jan, and Aunt Joe about a funny music tape we have. I told them that we played it through the years when we needed a good laugh. Now, get that religious smirk off your face or just stop reading if you can't stand a little carnality. The name of one of the songs is "Heaven Yes, Hell No!" That's right. I said, "Heaven Yes, Hell No!" Man, we have laughed over that one. I don't cuss, but we sure like singing the lyrics. Then I told them another one entitled, "I Thank God for the Preacher, Who Scared Hell Out of Me," and I sang a bit of it. All of a sudden Kristy spoke up and said, "You have to put a "break" in it." We all looked at her, but I knew what she was thinking from past times we shared together. I didn't know what she would or could do though. Who Scared Hell Out of Me!" We rolled on the floor laughing. It was too funny. I had gone from early morning wonder?--to sweetness--and now to a moment too funny to truly describe. As everyone left the room, I held Kristy's hand and sat with her. Time passed. Then I thought I'll play the Scripture readings I have on my Ipod. The Scriptures began to flow. Verses about life, healing, and God's love. "Do you like hearing these verses," I asked. "They are wonderful," she responded. So sacred the day ended. There is a very keen, unusal presence of God that is filling our home. We have dedicated our lives to bring honor and glory to His name. God's presence has filled our marriage and now the glory of His presence is deeper, fuller, sweeter, stronger, and sustaining. We are grateful that He is walking with us. Yesterday she had a turn for the worse with fever, confusion, and is much weaker. Her breathing is shallow and struggles to have any communication. We had to call the hospice nurse in the night, and thankfully, Kristy began to rally. This morning, Sunday, she recognizes me, but is very, very weak. We are trusting in His loving care. Please continue to pray for Kristy and us. We are grateful for your intercessions on our behalf. Kristy wrote this post over two years ago. I am humbled and grateful to have such a wife who earnestly sought God for her life mate. Oh, I have been blessed. Kristy, here from a previous post. I've written a novel that echoes mine and Milton's love story, and I have permission from Mrs. Ruth Graham to use her poem in my novel. One day I hope to see that story published, for the theme is "Purity before marriage and fidelity afterward bring great reward." Oh, it's so romantic!I hope you enjoy reading "Let Him Be Like Thee" and "And So He Came," below.I bless you in the name of the Lord today, that those who are close to you who are seeking a mate will find God's choice, the best choice. Amen. I did not write a poem for our wedding ceremony, but I have written volumes about my dear, sweet redhead since then. Oh, how God has blessed me with the most wonderful wife, friend, and lover. My emotions have been running away with me. It's hard to explain though I guess it would only be natural that such a thing would occur. Kristy and I are people of faith. We believe God heals and He heals today. So we're praying and believing. We committed our ways to Him years and years ago. So regardless of the immediate or distant future our faith rests in Him. My mind is filled with so many memories. Thursday and Friday nights as I tried to sleep, my eyes and heart were filled with beautiful imagines of Kristy and all the wonderful things we have shared together. Over and over they played. Her face kept glowing in my mind. There are so many dreams we have yet before us. I can see them all, but my faith falters that we will fulfill them. I reach out to His mercy. I have a rest and peace in my heart and then at the next moment my heart aches and breaks. Tears fill my eyes. Emotions began to overflow. Then I tell myself all the things I have told others as a pastor. I know God's Word and I quote it to myself. Jesus is alive. He is with us. He is the same yesterday, today, and forever. By His daily grace, we will make it. And then questions come again. How did all this happen? How did we get to this point? What does today and tomorrow hold? Our recent steps in our journey have not all been sad. There has been true joy and wonderful peace. The cloud of peace is still resting over Kristy and she is sitting in a chair of strength. God hasn't failed her nor me. Kristy and I feel the prayers and love of our dear family, wonderful church, and friends. You have been a bridge that is helping us cross these troubled waters. We will trust in Him. Friday was a mixed day of rest and sleep and some discomfort for Kristy. She wasn't as alert. She experienced some pain and we had to give more meds. She wanted me close and put her arms around my neck and shoulders. Our love is sweeter and stronger than ever. Marriage is a life of constant adjustment. Problems arise when neither partner is willing to give or one partner pushes the other. Differences are inevitable so successful marriages learn the art of give and take and compromise. Here is a post Kristy wrote about me back in November of 2006. Change can happen. It happens best when hearts melt together. Late in the afternoon, Milton popped in our Masterpiece Theatre DVD of Pollyanna. His sisters sprawled in front of the TV with him watching it, and everybody else in the huge great room did too. Pollyanna is a good movie to watch on Thanksgiving. This version is nearly as good as Anne of Green Gables (though not nearly as long), and the theme is being thankful--"glad," Pollyanna called it. Pollyanna's father was a mission pastor, and he'd requested a doll for Pollyanna in the mission barrel. Instead of a doll, the ladies' aid society sent a pair of crutches. She was disappointed, and he taught her a valuable lesson about being thankful (glad) in the bad or unpleasant times of our lives. "What's there to be glad about getting a pair of crutches?" she asked him. He thought a moment and said, "Well, at least you don't have to use them." She transformed a whole town with her glad game, even the preacher when he was upset at the ladies for wanting to have Sunday school on Tuesday. He was tempted to preach a vindictive sermon, and Pollyanna "preached" at him instead. She told him the words "Rejoice and be glad" were in the Bible 800 times, and if God said them that many times, then we should be glad in all things. It's funny about my husband watching Pollyanna. He's become a romantic soul at last. He actually enjoys watching chick flicks with me. He occasionally rents or checks out from the library light love stories for us to watch together such as Pride and Prejudice and other Jane Austen stories, etc. He selects them--him, this football fanatic! And every time Ever After comes on TV, he watches it all the way through. Jennifer, our daughter, chuckled about that the other day when I was in Puerto Rico with her--how many times Milton's seen Ever After. So if you're in a mode in your marriage where you wonder if you and your husband will ever have anything in common, take heart. There's a melding and melting of hearts as time passes, and it's refreshing. She had a sleepy Thursday and moderate pain. We have had to adjust her meds some. 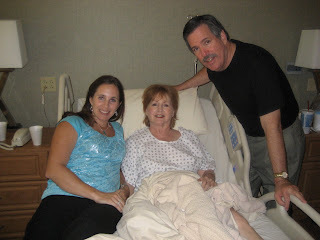 She is in good spirits and we are trusting in God's loving care. Jennifer came into our bedroom Wednesday morning and Kristy looked up and said, "Oh, my beautiful daughter is here." It thrilled Jennifer that Kristy would recognized her as we had just talked the night before and Jennifer thought Kristy was forgetting who she was. That is part of the severe struggle of brain cancer, but praise God, the Lord is helping Kristy and her mind is staying relatively clear. Wednesday morning after the nurse had gotten her ready, I was sitting on our bed next to her hospital bed and told her how pretty she looked. I said, "She has the most beautiful face and skin. Her color is gorgeous. The nurse agreed and commented that she didn't have any wrinkles. Kristy smiled and said, "Thank you." I said, "I have taken good care of her all these years." Kristy said, "You have taken the best care of me." Later, Jennifer and I were sitting there talking and I noticed Kristy was quiet and in deep thought so I asked, "What are you thinking?" She said, "I'm thinking about my beautiful daughters." "Well, what about your handsome (and humble) husband," I asked? "I have gotten there yet," she responded. We all laughed and she grinned. You can only imagine how much these moments feel. They are beyond special. We haven't given up and we continue to trust in Jesus for Kristy's healing. She is eating better and has been able to enjoy being with us in our family room. Today I told her I was going to go get a couple of Krystal burgers for her. She smiled big as she enjoyed. She and her brother Terry especially like Krystals. Getting them when they were young was a special treat. They still are a treat around here sometimes. WOULD YOU STAY TRUE? IF...? I don't usually post twice each day, but I have just been reading some of Kristy's past posts. The following is more surreal than you could ever imagine. Never in my wildest imagination could I dream of facing a scenario as Kristy wrote about in September 7, 2006. I can tell you that because we have lived a marriage of love, the answer to the following question is easy for me to answer. I'd like to put the question to you again: "Would you stay true to your spouse if s/he became debilitated? "I can quickly think of a couple of public examples of this scenario. The first one that comes to mind is Christopher Reeve and his wife. An actor, he had an accident while filming a movie and was left a quadraplegic. From all reports, his wife stayed true to him. I can still see images in my mind of her bent over him or stooping beside him for press pictures. The word "doting" often came to mind when I saw them. What would you do? Since this is such a weighty subject, here's something light: Has your marriage become more of a partnership than an intimate relationship, with the focus on car pools and bills instead of cuddling and bonding? In our home, we instituted a "rule:" whenever the first one leaves in the morning, s/he goes and finds the other one and gives him/her a 20-second kiss. Whenever the second one arrives home in the afternoon, s/he goes and finds the other one and gives him/her a 20-second kiss. Today was a mixed day here at our house. 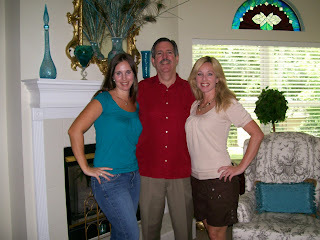 Kristy was able to enjoy being with us in our family room. She loves it when she can get out of our bedroom. It was great fun. She sang along with me as we watched a DVD. Then the boys came in with Julie and we all laughed and had a big time together. Yet, it was a hard day too. 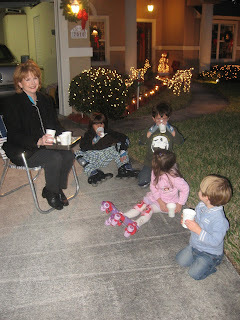 Julie and her boys had to head back to Tampa late Tuesday afternoon. They have been here a couple of weeks and it has been so much fun for all of us. Kristy loves having the grands all around her. Alex took leaving real hard. He begged not to go. He didn't want to leave not knowing if he would see his Nana again. I talked with him about it, but I said I wouldn't lie to him. I couldn't promise Nana would be here when he returned, but I could promise we would see her and all our loved ones in heaven if Jesus is in our hearts. I told him that heaven is real and we will all be there one day. That is comforting to an eight year old just as much as an adult. 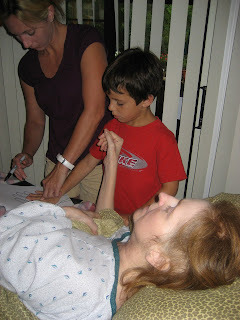 Julie got her boys next to their Nana and took a black marker and drew her hand imprint twice. Then she took the boys individually and drew their own hand imprints inside Kristy's larger hand. Then Kristy kissed both imprints so they could have her kisses with them forever. That helped them, though it was tough for me to watch. We have laughed as you all know, but we have cried too. Today was mixed with tears and laughter. Yesterday Jennifer took Claudia and Lorenzo with her to Target. Claudia begged and begged for her mommy to buy her something. Jennifer had told her going into the store that today they were not buying anything for her or Lorenzo. Finally, Claudia looks up at her mom in a sassy and very articulate way for a four year old and says, "Well, I'm just going to whine until you buy me something." Jennifer looked down at her and said holding her laughter in, "Claudia, it doesn't work that way." If that lesson could only be a one step plan, wouldn't Claudia be a happier little girl? Monday afternoon Kristy was ready to get out of bed. She hasn't been up for over two weeks so this was certainly amazing. I have physically picked her up out of bed in the past when she had been able. Now we have a hydraulic lift, and I brought it into the room to use. She hadn't seen it before and when she saw it saw she said, "Oh, we have a flying trapeze!" We all fell over laughing and she laughed too. When we got her in it, she sang and laughed and thought is was the grandest thing. This lady is some kind of good sport. She has always had a way to make everything lively. Guess what we watched together on TV? Not football, not baseball, not ESPN. Let's hear it for HG TV. She loved it and said over and over, "It's so good to be with our family." It's the little things that count in life. I just looked up behind Kristy's computer screen where I'm typing this post and I'm reading a quote she has tacked up on her board. It reads, "A great story is life with all the dull parts taken out." --Alfred Hitchcock. Boy, Kristy excels at taking all the dull parts out of our lives. Everything including flying on a trapeze has pizazz and flair. This morning was especially hard for Alex. He is the oldest and is more aware of what is happening with his Nana. He always goes into see Kristy each morning before he lives and kisses and kisses on her face. Today he and Nic are going back to Tampa. He came out of the room weeping over leaving his Nana saying he won't get to see her again. We comforted him and prayed with him. 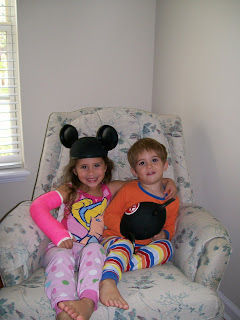 Please pray for God's love to reach out to Alex and all the kiddies and family today. Late Saturday afternoon Kristy called me to her. She said she wanted relationship. She wanted to talk. We reminisced about many different things--homes we had built, jobs she had done, things we had shared. After talking a long while, I began to share with her why I love her--her beauty, her talent, her kindness, her creativeness. I love her hands, her heart, her helps to so many. The list goes on. Then I asked her why she loved me. She said, "I love you because you share love, and we even each other out." Her words meant more than I can express. She could not have said anything that would have meant more to me. Kristy had just given me the highest compliment I could ever receive from anyone. This video was taken earlier in the afternoon and is quite funny. Kristy always has fun going. She told me Saturday, " Go gargle....Soon!" Julie and the kiddies had a real scare Sunday afternoon. They had gone to the zoo and were hit from behind by a speeding car. The kiddies are OK, but Julie is real sore. We thank God they were not hurt worse. Saturday afternoon one of the grandkids wasn't happy and was crying. From her bedroom, Kristy heard one of the daughters trying to correct her child, and it wasn't going real good. Tricia and I were standing next to Kristy and comforted her letting her know that the grandchild would be OK.
A few moments passed and the child was still unhappy and crying. Kristy said, "Let's try a different tactic." Tricia and I said OK not really knowing what she meant. Then Kristy began to pray out loud, "Lord put your hand on our grandchildren. Give those who watch them understanding to care for them. Bless our grandchildren. Keep them safe." Tricia and I were amazed. There was such an anointing on Kristy's prayer. Her tactic works. 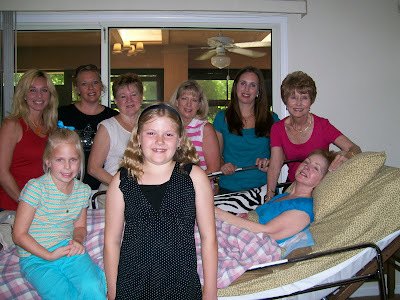 Then Kristy asked to have all the grands come into the bedroom. She wanted to give them a blessing. The kids acted like kids as the video begins and Claudia got her finger mashed when we sang toward the end, but it is really touching what Kristy did for our grandchildren. Kristy slept a good part of Friday. I think she needed a day to recoup from such a surprising and wonderful Thursday afternoon. I have shared her favorite family sing-a-long, I Found Happiness. She has not stopped singing. Friday evening we were listening to some beautiful worship music on my Nano Ipod. Even though she was very tired, she would join in singing with the different singers. God's presence is truly filling our house and our lives. All the ladies present Thursday afternoon wanted a picture together. Don't they look great, especially that cute redhead in the turquoise. Later that evening, I looked around and I'm the only man in the house. Boy, did I want to run for it. They watched a chick flick on the DVD. I hid and read. Just kidding. They have been such a huge help to Kristy and me. God bless them all! Just when you get to the end of the road, God's amazing grace comes through. That's what happened Thursday afternoon. It was Kristy's best day yet since coming home from the Hospice Center. 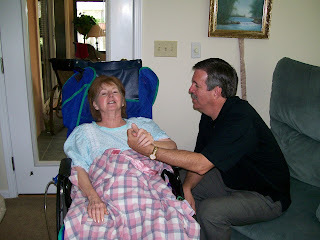 She laughed, made jokes, smiled, praised the Lord and even led our family with her desire to worship the Lord. Gaither's eat your hearts out on these videos. For quite a while in the afternoon she sang worship choruses of praise and adoration to God with us. I had to unload my digital camera to be able to continue to record all that was happening. It was just awesome! Three days ago, Rebecca's daughter and son-in-law, Robin and Randy, returned from Austria where they have served the last four years as missionaries. Randy accepted Jesus years ago in the church in Bartow, Fl, when Kristy and I were serving as pastors. It is thrilling to see God use them for His glory. Robin and Randy's two children sang and played the guitar for their Great Aunt Kristy. They were bashful and didn't want to perform. Well, I offered five bucks to Kalyn for her to sing and the others chipped in and payed her brother Noah to play. It was worth lots more than five bucks to me to hear them. I really would have paid them more. Listen to them. They filled our house with praise to God. Watch Kristy join in and sing along. I'll play another couple of clips tomorrow of our worship time together. The last few days have been especially hard for me. Emotionally I'm drained and am being challenged in other ways too. Yet, God reaches His hand out when I am in need and touches Kristy and me. Last night right at bedtime, Alex and I were in the bedroom with Kristy. He kissed and kissed her all over her face and, of course, I had to join in the sweetness. Kristy looked up and said, "Tell me something funny." She had just been struggling with confusion and was not feeling so well. But, she reached out for cheer. We thought for a moment and were kinda stumped and then we just began to laugh. She laughed with us and we all felt better. 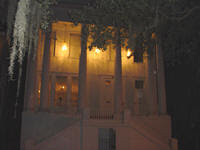 Two summers back we celebrated our 35th wedding anniversary in Savannah, Ga., at a beautiful B&B. We arrived Sunday afternoon, unloaded, and went out for dinner downtown overlooking the river. 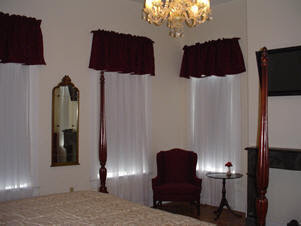 We returned late and went upstairs to our presidential room overlooking Forsyth Park. I'm lying on the bed watching the huge flatscreen TV hanging on the wall over the mantel. Kristy is puttering around in the room and reached out to adjust the shade covering a huge window overlooking the park. The whole, big shade comes tumbling right down. Now the world is looking into our bedroom. It's late. The proprietor is an old lady. We're the only ones staying in the Inn that night. The darkness of night is peering into our room, and there's no ladder to fix this dilemma. Frustration took hold in me. "Why couldn't she have left well enough alone," I thought. I didn't say anything much that I remember, but my expression gave me away. Well, here I am standing on the back of an old rickety chair, straining as high as I could, holding t he shade in one hand, balancing with the other, and dressed in less than my Sunday best. It wasn't easy, but finally all was repaired and I climbed down. I burst into uncontrollable laughter. She began to laugh and we stood there hugging and laughing and about to roll on the floor. Laughter made a lot of tension go away that night. Laughter has brought lots of medicine into our lives. We laughed. We shared. We dreamed. We explored. We prayed. We learned. We held hands. We drew closer. We reflected. We gave thanks. She had another mixed day--confused and alert. Emotionally, as I mentioned earlier, it has been extremely hard for all of us. We are trusting and holding to His faithful hand. The coffee is brewing. Can you smell it? That's been the first item on the agenda at our house for years. Way back, Kristy coaxed me into putting the coffee on one morning. I am not much, really not anything, in the kitchen and she was needing a little help. So I put it on that morning and she bragged and bragged how good it was. The next morning I asked her to put it on to brew and she said, "You make a much better cup coffee than I do. Please make it today." All along she talked about how good my coffee making was. I was a little proud of this new skill. Boy, did she snooker me. It dawned on me after a few years how silly it was to think I could do anything in the kitchen to measure up to her. Now remember, this is the Kristy who wrote Kristy's Kitchen, a cooking column. She is something in her kitchen. Bragging on your mate is better than pushing them. Kristy could nag me about things, but she was more often very shrewd. She dedicated her books to me calling me her "hero husband." I assure you that was and is motivating to me to my higher good as a husband. Yesterday was a mixed day. Sometimes she was confused and other times her mind was very clear. She continues to sing and worship. She loves our kisses and smiles so sweetly. Claudia came bouncing into our bedroom at nighttime with a new pair of pj's on. "Look papa," she said. Nana looked at her and said, "Woooo," with real expression. Claudia had the biggest grin of satisfaction. Love as lived out by humans will always require forgiveness. We're all human and not perfect and fail. This certainly is true between husbands and wives. Kristy and I have never proclaimed to have a perfect marriage even when we taught marriage seminars and wrote articles to help couples. In fact, sometimes it was hard to write and speak on marriage because we aren't the perfect couple. We are faithful to each other. We work through our troubles. That's what true love, God's love, helps you to do--to work through the issues, forgive each other, and go forward. Having made an honest confession I can tell you, "We have a wonderful, wonderful marriage." Yesterday Jennifer Johnson wrote the following that I wanted to highlight. Maybe it will help someone today! You don't know me...ha! I don't know you either. Anyway, I'm one of Kristy's fellow Heartsong writers and ACFW (originally ACRW)friends. I want to share a remembrance with you. Several years ago, Kristy wrote a response to something on our loop. She wrote about how you two had a miserable fight and she cried out to God to make you see the light of day and come running, apologizing all the way, to her. As she was praying, she felt the Holy Spirit nudge her that she needed to go to you...not just for a hug, not just for a kiss, but to give herself completely to you. After several moments of arguing with the Lord, she succumbed to his instruction. After your cleansing time of forgiving one another, Kristy told you what God had instructed. Your response was "Praise God!" Her post was so much more descriptive then my above summation, but I remember that so vividly. At the time I was a young wife and a mom with young kids, and there were often times that little and big squabbles bubbled up between my husband and me. Touch was (and still is) a balm to begin the forgiveness and healing process. When I told my husband that story, he admitted he liked God's way of handling the situation as well. We still laugh and bring up the times God's instructed the same of me. I don't remember how many years ago she wrote that, but it left such a sweet impact. She had another good day. We have music playing throughout the day in her room. I caught her singing along in a small whisper several times. It was incredible. I kissed her forehead today and she said, "Come closer let me smell you. I want to smell your scent." This woman is something. We had two ministers come by and pray with her. She lifted both her hands in praise and worship saying, "God is so good." She wept tears of faith and trust asking God to give her life. Kristy is in God's loving hands. We are all in God's loving hands if we trust in Him. I yahooed Kristy's name the other day and quit scrolling at the 19the page. Her name appeared over and over for her books, being mentioned in blogs, articles that she had published in newspapers and magazines, and other articles written about her. Don't yahoo my name. There's not much to read. HA! When she freelanced she was given all kinds of assignments. I hope you've never had head lice, but I bet many of you of the best families who have children could have used her article on head lice. What a pain that was when our precious "little" daughter brought them home from school. We've never had a houseboat, but she did an article on some guy who built one and lived on it. I told her that one day I'd get a boat if she ever made a huge sell. It hasn't happened. She could be famous if she made me rich was the specific deal. HA! And all the real knowledgeable writers said "HA!" again. Her genius for tackling the unknown was amazing. She could see the end product well. She always had a goal and was ready to meet it. A couple of days ago as we were giving her meds she asked in her confused mind just as they were about to be given, "What's the goal?" We said, "For you to get better." "Okay," she responded and took them. That's Kristy. What's the goal and let's get on with it. Kristy woke up alert asking for me. I asked how she was feeling? She said, "Tremendous." We sang, "Good morning to you," over and over to each other and then had a sweet time of prayer. It is a good morning. God is good. Rebecca, Kristy's sister, left Saturday after being her to care for Kristy a couple of weeks. Oh, she was such a blessings as are Norma, Kristy's friend Sandra, and now Sandra, Terry's wife, who is here to help. All my family and so many dear church people and friends have extended their hands to us. I am humbled and am so very grateful for their assistance. These are godly people of faith--their faith is evidenced by their love of caring action. Now it's my time to care of my mother. 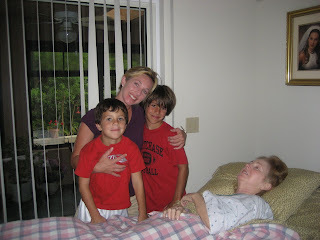 This picture shows perfectly how my mother has lived her life- always thinking of others. This picture was taken this past Christmas. Mom had her brain surgery in November and was still recovering. We were going to go on a neighborhood hayride a little later, but Mom wouldn't be able to do that with us. My father, my children, my sister, her husband, and their children were all outside putting up Christmas lights. 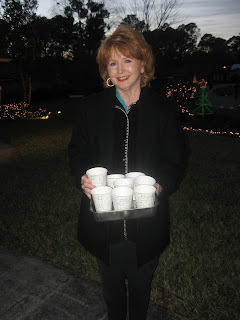 As we were outside, out walked Mom, with a tray of hot chocolate. She is so sweet. She has always been this way. All my life she has taken such wonderful care of me. I have such special memories of times in my life when I was sick, or suffering with a migraine and she so sweetly and patiently did special things that made me feel comforted. Sweet, patient, caring, loving, kind… These are words I've repeated several times. But they accurately describe her. These are the words that pop in my mind every time I think of my mother. Doesn’t this remind you of God's love too? My mother has taken such wonderful care of me my entire life. Now, it's my time to take care of her. I thanked Kristy Saturday evening for making me a father by giving me to beautiful daughters. Julie and Jennifer took me out to an early Father's Day celebration for lunch on Friday. We ate overlooking downtown on the St. Johns River and they treated and gave me the most beautiful, loving cards expressing their feelings to me. They are wonderful daughters. They have given Kristy and me four beautiful grandchildren. God is so good. She rested most of Saturday after her more active and alert Friday. She wanted me close but she didn't talk as much. I told her funny stories we lived out. We have had wonderfully blessed and sometimes hilarious times together. She likes the funnies and I do too. The laughter is health and healing from the Lord. We prayed, listened to soft worship music, and briefly sang along with the music on my Nano Ipod. God's presence fills our bedroom and more--our hearts and lives. Yesterday Kristy had her best day in over a month. 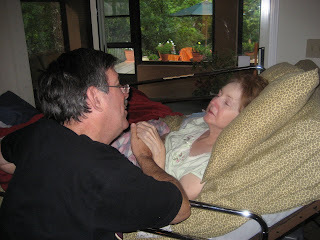 She was more alert and clear in her thinking and could talk more than she has since before going to Hospice. It was truly amazing. I read the blog to her from yesterday about sharing her secret make-up. She grinned all the way through it, but when I finished she said, "Is that all?" It kinda hurt my feelings. I was looking for some writer affirmation and she thought there should be more to it. We all laughed and laughed. I've had her red line my articles in the past and blood was everywhere. She's a tough cookie. Well, really she just likes it RIGHT! One time yesterday, I stood at her door to check on her. She said, "Come here and give me a kiss." "Oh, Kristy, here I come," I said. Her clear moments were longer and very, very sweet. Over a month ago, the doctor estimated she would live maybe a week. Today she is better than she was then. We are trusting in God's loving care. He is faithful. The doctor and nurses are doing a great job and we are grateful, but we are also resting in One who has everything in control. 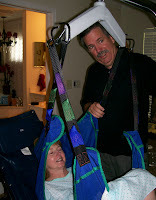 Terry asked Kristy if she was still covered with a cloud of peace and resting in her chair of strength? She said, "Yes, God is with me." Kristy's inner beauty is not a secret make-up. It radiates from deep within her soul and spirit and fills our home and blesses all who are within its glow. Its Jesus in her. She is something special. But...ssh...ssh...whisper, come closer. I want to tell you a secret. First, let me see if anyone is watching......I think the coast is clear. OH NO. THEY CAUGHT ME. RUN, RUN, RUN FOR YOUR LIFE. I give up. I won't tell. Please give me another chance. POW, CLANG, BANG, PUNCH, and listen, Buster, don't you forget it! Good grief. Who would believe "little" Kristy and her gang would take "secret make-up" so seriously. She must feel better today. Help! Somebody call me a doctor. Is it true? Do all women have secret make-up? I don't know. Men are dumb--stupid on those things. Kristy was aglow yesterday. Her color was just simply beautiful. Her skin color and hair color have always been beautiful but they were more radiant for some reason in the last days. I've always told her how beautiful she is to me and I did yesterday too. "You're so beautiful, Kristy," I said. One of the ladies from the church brought food late yesterday and slipped into her room to see her. She was sleeping. Mary Jane quietly said, "She always looks so beautiful. She is beautiful." Just before she went to Hospice when she was having difficulty finding and remembering things, I would help her find and pick out her make-up. She struggled to remember what each item was and would say, "Men have it so easy." I would say, "Can I help you put it on?" She would look at me, "Are you kidding? No way!" She has always gotten ready really fast and looked like a knockout, but now her natural colors are coming out more and her beauty inside is glowing with colors beyond my words. She can't sit at the mirror and put anything on her face or fix her hair, but she's a beauty. She must have some secret make-up. I wonder what it is? Yesterday was a good day. She talked all throughout the day with clarity. There were confused moments, but she actually talked on the phone twice to family and I called on my way home from church last night and talked to her. We are trusting and believing God. God is good. Please keep Kristy and us in your prayers. Tania, a pastor's wife in South Carolina, was killed in a vehicle accident Tuesday afternoon. Terry, Kristy's brother, and his wife Sandra stopped by here on their way south and had been gone from our home a brief while when he called. "I have terrible news," he said. "Larry, who pastors in Summerville, his wife Tania died within the hour." Before Terry could utter another word, I cried out for mercy for this family. "Have mercy, have mercy, show mercy, mercy, mercy, mercy for this family. Lord have mercy on them. Help them." Tears went down my cheeks. How do you explain tragedy's unexpected call? My heart breaks for Larry and his children. Would you pray for Larry and his family? They need God's mercy today. Tuesday evening I prayed over the phone with a Greg, a deacon in our church, whose mother went to be with the Lord earlier in the day in West Florida. All this causes one to stop and think and draw nearer--nearer to the One who knows and understands. Kristy greeted and hugged all the grands Tuesday morning before they all left for basketball camp and child care. 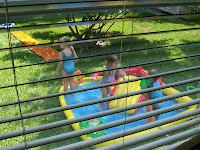 The kiddies enjoyed those moments with Nana. It helped them to hear her and see her reaching out to them. She slept throughout the day, but stirred when Terry and Sandra stopped by to see us. They will return the end of the week. Tuesday evening Kristy called out to me and wanted me close. I was there, but she needed reassuring. I kissed and kissed her neck and face. Or, I could write it in a much sadder tone as hard as that might be for some to believe. But its Kristy's blog and I've tried, ever so poorly by her standards, to share with humor, life, true reality, and with spiritual value. I'm struggling to keep her manner, and I know that we all write with our own voice and mine is deep bass and masculine not her dainty, romantic, make'em laugh, make'em cry, make'em wait style. I am writing from my heart and from what I feel I should share. I've memorized chapters from the Bible I could quote and I've got thirty-six years of sermons to draw from, but that is n't her style either. Water and more water and life all around this house. It's wet'n wild at our place. That's what four grands add--2,4,6,8 they are so much to appreciate. Oh, they bring such energy and love for life. Monday evening, Claudia danced around at the foot of her Nana's bed repeating, "Kristy, Kristy, Kristy....Kristy, Kristy, Kristy... Kristy, Kristy, Kristy...." in her sing song manner. Kristy smiled big and wide. She could not talk, but the smile would not go away. She is awake some, but sleeps more and more and is harder to stir. She can express her love and reach out to us. You can sense her love and faith and God's holy presence. For the last weeks Kristy has been sleeping more and more and I have been sleeping less and less. This morning I overslept and boy does it feel good. If I can get another night or two sleep like this, I will feel half human again. Kristy rested in the night, but woke up around 5 AM to talk. Rebecca and Julie slept in her room with her, and Kristy called to Rebecca to talk to her. Kristy can't always say what she is thinking. It just won't come out right. Then other times she is so clear yet speaks in weak whispers. Rebecca comforted her and assured her everything was OK.
Kristy has a major in journalism and a minor in communications so this is so hard to bear from one who has always been so vibrant, perky, and focused in what she says. Dad preached for me again yesterday and did a super job. Tricia, my middle sister, and her daughter Stephanie came with Mom and Dad, and we enjoyed having them in our home for the afternoon. Kristy loves seeing family even if she can't always fully communicate or know what is happening. A sweet couple in our church brought us food from Olive Garden for Sunday dinner. Oh was it good. The love of our church family is amazing and so strengthening. Mom, Dad, Tricia, Stephanie, Rebecca and I had a wonderful time of prayer with Kristy before my parents had to go back home. God's presence filled the house. We prayed in faith with great love and with an unusal peace that settled in the room. It was a sweet time of prayer. We need His strength, comfort, and grace. We're getting ready for church and heading to worship. I have found that praise and worship are along with reading God's Word are the quickest ways to boast my faith. All of us get spiritually stressed by life and have times when praise and worship seem impossible, but waiting before God, choosing to live out our commitment to Him. and looking at His greatness all move me to open my mouth giving Him glory.....then something miraculous happens. Hope and faith rise. Today we will worship and giving glory. He is still Lord of our lives and is working for our good. It is hard to see as I will readily admit, but He is working and we trust Him. She was thrilled to see Alex and Nic as they arrived last night. All four grands are here with our two daughters. She reaches out to them and weakly hugs and loves. They are ages 2,4,6, and 8 so they all have different understanding of what is happening. But they all love Nana, and wow, she loves them. Kristy rallies with clear thoughts and communication mixed with confusion. Her smile and praise continue though fainter. Kristy rested well all Friday. She sleeps more than she is awake now, but there is still amazing love and care that flows out of her. It is easy yet hard for me to describe. There a small tears of love that flow down her face. If there are more than one or two in her room, she has weakly, very weakly, gestured words to get more chairs for them to have a place to sit. Kristy has always had a loving, deeply passionate desire to bless and help others. But there is so much more that is happening there that is deep, spiritual, and very personal. Kristy asked me to journal on her blog for her when she couldn't back when she first had the surgery. I have faithfully posted daily when she couldn't write. This has been a very practical and quick way to keep family and friends updated. It is a story that has pushed out my fingers on this keyboard. Regardless of what happens this will be an incredible remembrance for my children, grandchildren, and me. I pray it has been a blessing and encouragement to all who read it. Claudia and Lorenzo were sitting behind me in our office as I typed this and all of a sudden they said, "Papa, take a picture of us." I did and Kristy would love it. I have printed out this story as it is posted since November. It already fills a book and there is so much more to write about Kristy. Her blog began a couple years before her brain surgery and is filled with life and love. Her files bulge with her writings, fiction and nonfiction, and all this came from a woman who was busy, so busy, doing, living, and serving beyond her writings in ways that most could not comprehend. My mind is running with memories, memories, memories. Sweet memories, servant memories, secret memories. I will write more as I am able. Thanks for walking this journey with us. Thanks for caring and praying. Thanks for being there even at a distance. We feel your love and prayers. Thursday morning Kristy ate a small bowl of oatmill and perked up briefly. She held me close and weakly shared her love. Her Aunt Jo and Cousin Jan came to see her and they always get a stir fr0m Kristy. She had a better day overall. Thursday Carrie T. wrote a comment on Kristy's blog concerning an interesting Internet promotion by CBD. They had sent out a promo that included a author/artist review by Kristy which was actually written in 2006. It was sent out just yesterday as I understand it. When I saw the interview I printed it out and read it to Kristy. She had been sleeping, going in and out, but when I shared the interview she perked up, smiled, and raised her hand and praised the Lord! She kept a smile as I read the whole article. Isn't it interesting to see this real and personal illustration of the power of writing. Kristy is so terribly sick in bed but her written words reach out beyond her and touch others around the world. Here is the Internet connection to CBD and the novella that she coauthored. Here is the article as I copied it from the site. Read the last part. I have heard her share this many times and it always inspired me and those who listened. 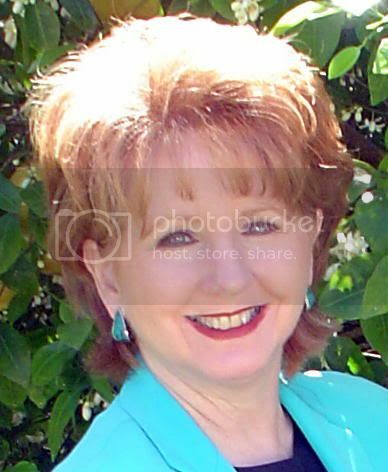 I have nine titles of Christian fiction with Barbour, and I've written over 600 published articles and worked for two New York Times subsidiaries. I'm happy to say some of my works are award-winning, such as my novella in Church in the Wildwood won Third Place in the 2004 American Christian Fiction Writers Book of the Year Contest (novella category). In the 90s, I had a dream to write and publish Christian fiction. I studied the craft diligently (still do), took a weekly college fiction-writing class for four years, got a critique partner, and wrote till my eyes burned. In 2000, my dream came true when my novella appeared in American Dream, and amazingly, it hit the Christian Bestsellers List. I'm touching hearts with love and laughter with my writing, according to the reader mail I get. Got a reader letter the other day, and she said, "When you almost want to pray for the characters, that is a high compliment to the author." Another said, "I don't generally identify so strongly with stories, nor do they usually cause me to change the way I do things or think. Yours did. Your writing, and in turn, you, are a blessing to me, and I wanted you to know that your work did some good." I pray I will always lift up the Lord and bless people's hearts with my fiction. I love to cook. As I said, I was bred on Nana's layer cakes. And I love to entertain. As a pastor's wife whose hobby has been cooking and entertaining, I've often felt like I've run a B&B with all the people I've hosted, such as missionaries, evangelists, singing groups, etc. When I worked for a New York Times subsidiary, the editor said one day they needed a story about cooking. I said, "I've cooked for 100 people in my home and love to cook. 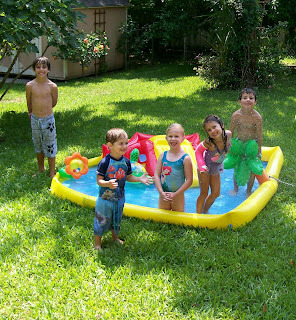 Last week, I had a dinner party for 22 people and had a ball." The editor said, "Write me a story. By tomorrow." So I did, and a weekly column entitled "Kristy's Kitchen" was born. So when I dreamed up Kiss the Bride, I envisioned four young women in the food business. They all own restaurants, they meet at a restaurant convention, and they bemoan the lack of men in their lives. Then, each novella tells each of their love stories. During the entire book, they pass around an apron with the words Kiss the Cook written on the front. The last groom crosses out "Cook" and writes "Bride" because the girls have all become brides by the end of the book. Fun! I am one of four co-authors in Kiss the Bride. (Coauthors: Kristy Dykes, Aisha Ford, Vickie McDonough, Carrie Turansky.) We all had a great time working on this project, and we hope readers will experience what I call The Three E's: entertained, encouraged, and enlightened. All of our novellas are based on scriptures, plus the book has a fun theme with a traveling apron among four cooks, so I think those expectations will be met. I was bred on Jesus and Nana's layer cakes in the Deep South, in that order. :) So naturally, my stories have references to Bible verses and eating! When I was a teenager, my mother gave me a copy of Catherine Marshall's Christy, and I was enthralled. I also read Grace Livingston Hill, Charlotte Bronte, Jane Austen, Victoria Holt, and other great writers. I'm a big reader of all types of books, from novels to how-tos to biograhies, to you name it. I believe a dream is a God-ordained desire that He's put down in your heart, IF you're walking in His will and asking Him to direct your paths. Whatever your dream is, it's attainable, if you'll pay your do's (misspelling intended). 1. DO rest in your call. 1 Thessalonians 5:24 says, "He who calls is faithful, who also will do it." Be assured that the Lord will bring about His divine plan for you, even through the hard times (like rejections for writers!). 2. DO everything you know to do and do it diligently, according to Ecclesiastes 9:10. Apply yourself. Study in your field. Work hard. Don't slack. And then keep applying yourself. Keep studying in your field. Keep working hard. Keep determining not to slack. 3. DO not want "it" above the Lord. Matthew 6:33 says, "Seek first the kingdom of God and His righteousness, and all these things will be added unto you." Put the Savior at the top of your list. Worship Him. Work for Him. Seek Him. And then remember Habakkuk 2:3: "For the vision is yet for an appointed time. But at the end, it will speak and will not die. Though it tarries, wait for it. Because it will surely come." My dream came true, and your dream can come true! I speak that blessing over your life, in Jesus' name! Wednesday was a very tough day. It began with my greeting you with, "Good Morning, World!" It got tougher and harsher. I wondered if yesterday's post was too cheery or perky sounding for what we are facing, but I don't regret writing and offering the title "Good Morning, World." I found that the Lord helped me and all of us through the day. THERE IS A HOPE. Kristy slept most of the day. She wasn't able to respond much to us. She took sips from a straw, barely, and ate some fruit slush. I held Kristy close telling her how dear and special she is and how much I love her. I prayed and whispered God's love into her ear. One time she was able to respond to my kisses. This Thursday morning she is slightly more alert. She reached out to me and weakly shared her love. We are trusing in God's healing grace. It's all by grace. Norma had to return home Wednesday morning. Oh, how dear my sister and family have been to Kristy and me. Rebecca is here now. She is a loving help. Sandra, Kristy's close friend, has kept watch and helps every way she can. Our wonderful church family is standing with us, praying for us, providing nourishing foods, and giving loving support. So many others have reached out to us in love and prayers and kind acts. Julie and Jennifer arrived back Wednesday afternoon along with Claudia and Lorenzo, Jennifer's children. The girls took Kristy's condition very hard. They love her so dearly. I have kept them posted, but they really couldn't comprehend how their Mom was doing. The Word we have believed, preached, and stand upon works. It works for us. Forget the old preacher's part, but remember the Lord is with us today. Romans 15:13 has long been a key verse in my life, "Now the God of hope fill you with all joy and peace in believing, that you may abound in hope through the power of the Holy Spirit." Each word releases the promise of God's goodness and blessings beyond measure for today. Good Morning, World! NOW THERE IS A HOPE! She slept most of Tuesday, but ate and then had confusion in the night. She is weaker and speech is harder. She had a weak smile and praise in her heart as she drifted off into sleep last night. This is a new day, we will rejoice and be glad! Please keep praying for Kristy and us. I never thought much about praying for a Kennedy of the Massachusetts's brand, but today I prayed for Senator Ted Kennedy. Monday Senator Kennedy had the same type of brain surgery Kristy had back in November and now he faces the same follow-up treatment Kristy as just gone through. It is funny how life experiences give compassion and new insight and turn your feelings. Not to judge, but I would not have ever connected a link with Kristy to Teddy. Kristy and Teddy may have some other commonalities other the brain cancer though I'm not sure what they would be, but I know that he has one terrible fight before him and he needs prayer. One thing we know for sure is that all roads of life lead to one final audience and conclusion. May God help all of us to live with eternity in mind as we make our daily choices. Monday night as I looked through more of Kristy's magazines more trips and fun times came to my memory. Besides pastoring for almost 24 years, we traveled for 12 years mostly here in the South and some across America and other parts of the world. Sometimes the trips were ministry mixed sightseeing and pleasure, but we had fun doing all of it. Two hearts bound with one goal--to honor Him. She slept more Monday and as I write this Tuesday at 8:30 AM she is just a little more alert. We have been very concerned the last 36 hours which way she was heading. Here is a powerful music video my cousins Kinette and Jan recommended that has comforted me . I have viewed it several times. Listen to it if you need hope. THERE IS A HOPE! Watch and listen. Sunday was another sleepy day for Kristy. She mostly dozed except for eating a good lunch and dinner. Doug and Susan came by and sang and prayed, and Kristy talked with our girls. Kristy will be clear in her thoughts for moments and then later is very confused. She keeps her smile and her praise. Oh, she is a woman of faith and love. Yesterday I preached a sermon from John 14: 15-21 on the topic, "The Spirit of Truth". Jesus said He would give us another Helper that He may be with us forever--The Spirit of Truth. Truth sets us free. It liberates and blesses. It releases the goodness of God into our lives. It keeps us from the evil and bad. We live in desperate times where truth is diluted and disputed, but Jesus is the way, the truth, and the life. He has sent the Holy Spirit who is The Spirit of Truth to keep us and guide us. The Holy Spirit is here today for Jesus has sent Him to be with us forever. I am personally so very thankful for all who are praying for Kristy, me, and our family. I was very sick and weak earlier in the week and am amazed that I was able to preach yesterday, but so many have prayed and lifted us up to God. I am grateful. Kristy is my partner in life and partner in ministry. Our marriage is a committed partnership to help each other, bless each other, and lift up Jesus. My partner still holds my hand and prays for me though ever so weakly. I am so very thankful. Late last night I picked up two old Southern Living Magazines to read as I slipped off into sleep. Kristy keeps them all over the house in magazine racks so there easy to find. One of them was a August 2002 issue with a feature on "Our Favorite Getaways on the Outer Banks". Kristy and I have traveled there a number of times to see our friends Ron and Judy and David and Kay, both who are pastors on the Outer Banks of North Carolina. I found the article and looked at the pictures and then my mind recalled memories we made there. 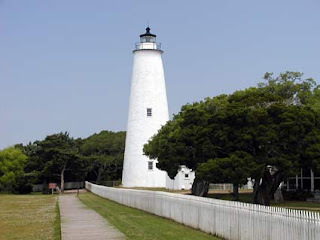 The article featured Ocracoke Island and Corolla. The lighthouses and history grab you and they certainly grabbed us. You can only get to Ocracoke by ferry. They both are so beautifully quaint and unique. We toured the old churches and historic buildings with Kristy holding paper and pen making notes for her writing. Her stories came from everywhere. Her eyes, ears, and senses were always seeing things the rest of the crowd missed. A lot of what they missed wasn't there. It was in Kristy's mind and heart and flowed out on her fiction pad. Oh, the stories she saw in those places. Inevitably we found the old churches and spent a few moments in them. We both enjoy history and especially the historic houses of worship. Our knees would bend at their altars asking for God's wisdom, guidance, help, and grace. I thumbed through a few more pages of the magazine. Winter Park, FL--We strolled there together. Memphis, Tenn--We toured there together. 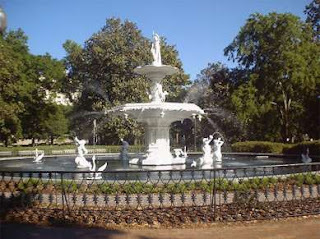 Charleston, S.C.--We saw sights there together. St. Augustine, FL--Made many day trips there together. Amelia Island, FL--Made our last get-a-way there just a month ago together. There were more places included that we shared together. Every page of this issue Southern Living opened my eyes, mind, and heart to the wonderful Southern living we have shared. Saturday was good and she slept through the night. The tumor is ravaging her brain. Her memory comes and goes. We have moments so special and then moments so tough yet tender. We are trusting in One who is mighty to save and deliver.